You may or may not know from our company details, but Piggotts has been around for a very long time. The company was first established in 1780 by two brothers in the heart of London and in one variation or another, has evolved and changed ever since into the current incarnation whose website you are on now. We have been making flags, flagpoles, windsocks, bunting and banners for a very long time now but Piggotts didn’t start out that way. The original company was founded in 1780 in London and set up shop at No.10 Old Jewry. In 1841 the company had to move to larger premises which were located in Cripplegate and in 1862 they had to move yet again to Bishopsgate in London. 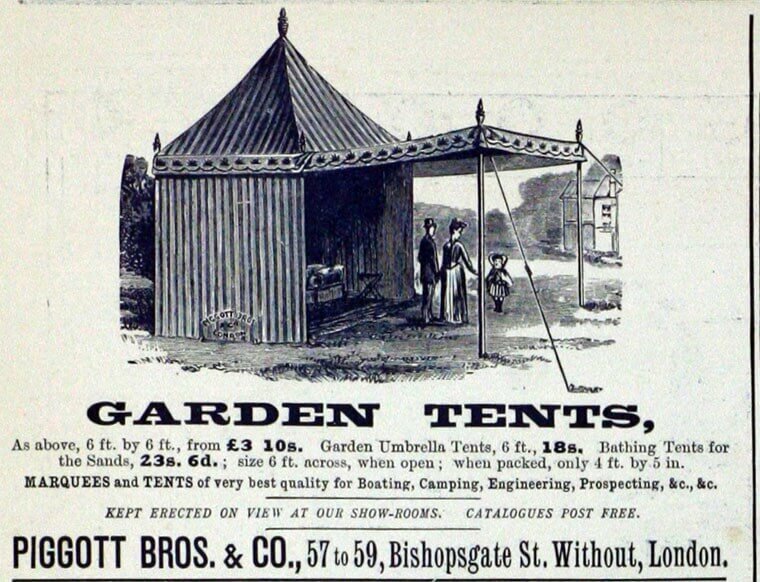 However, by August 1898, the company started to produce marquees and garden tents. It was from doing this that the company began to grow its marquees sections producing much larger structures, then progressing to airfield and military type marquees. This exposure created an idea that lead to not only housing aeroplanes, but also building them ourselves! The above photograph was taken in 1910. 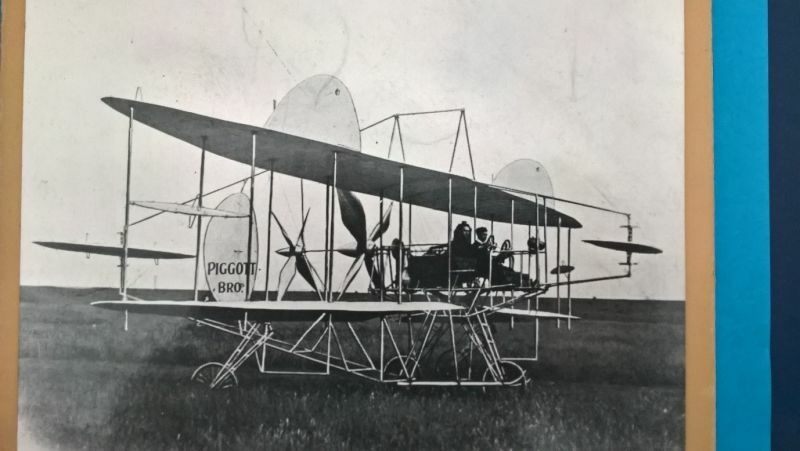 It was actually known as “The Metal Airscrew” and was one of two original planes that were designed by Piggotts Bros. In the years that followed, a number of other biplanes and monoplanes were created and entered for time and test trials at Hendon over the years 1910-12, the most successful being the “Piggott Monoplane” which was exhibited at the Olympia Air Show in 1911 and is believed to have been the first British Monoplane. 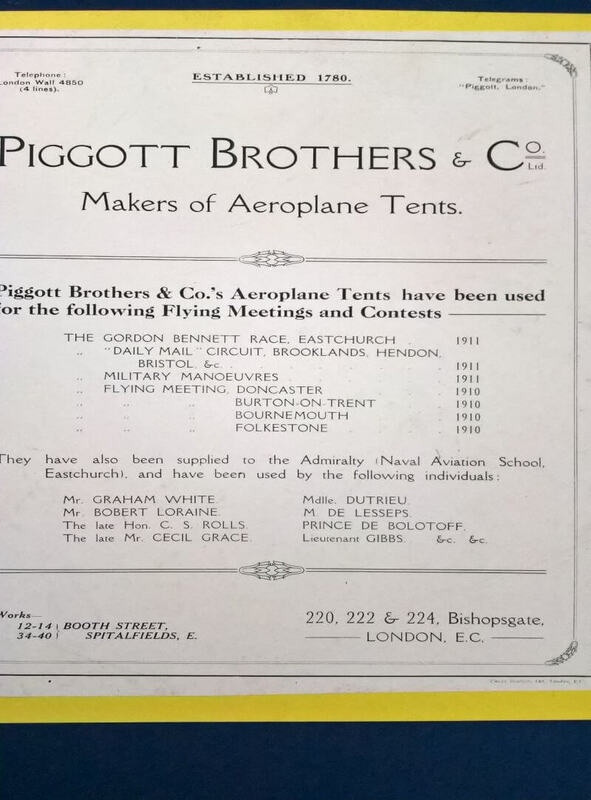 By 1937, Piggotts was listed as an Exhibitor for British Industries for tarpaulins, flagstaffs, flags, windsocks, banners, tents, rope ladders, canvas bags, machine covers, lorry covers and dust covers. In 1950, Piggotts started to supply the famous Regent Street Christmas lights and we became one of the earliest suppliers of fibreglass flagpoles, manufacturers of caravan awnings and designers of windsock masts for some of the first North Sea oil rigs. In 1970, the company moved to an eleven acre site in Ongar, Essex and by 1973 were supplying the Chelsea Flower Show with its marquees. In 2001, Piggotts became part of the Crown Group and continues to diversify the products that are sold. We continue to have some very prestigious clients that continue to use us, in part for our history together, but also as Piggotts remains one of the oldest private UK companies. New clients that join us, over time, also become a part of Piggotts’ continuing history.